PFASs are a large family of long-chain fluorinated chemicals used in many manufacturing and industrial applications, including fire suppression and oil, stain, grease, and water repellency. Among the many PFASs, perfluorooctoanoic acid (PFOA) and perfluorooctane sulfonate (PFOS) are the most commonly produced. 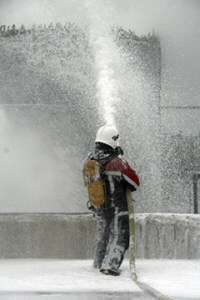 A major use of PFASs was in fire extinguishing aqueous film forming foam (AFFF). During fire training, equipment maintenance, and use, PFASs were released to the environment. Additionally, PFOS was used in mist suppressants in decorative and hard chrome plating processes. Under multiple NAVFAC and USACE contracts, OTIE is performing Preliminary Assessments/Site Investigations on over 170 PFAS sites in USEPA Regions 6 and 9 involving over 2,700 soil and 1,300 groundwater samples. We use stringent clean field sampling protocols to prevent PFAS contamination and to meet data quality objectives (DQOs) for decision support, all in accordance with our approved UFP-QAPPs.